The GX-3i offers a 6x magnification and features a crisp O LED display that makes it easy to read data against the background. It also features prism lock, pin targeting and a scan mode that allows for panning across multiple targets while receiving distance measurements. The lightweight device weighs only 7.7 ounces and comes with a durable aluminum body. Enhanced from the previous model the GX-3i includes an improved laser for accuracy and faster readings. It is a versatile device as it is approved for USGA tournament use. 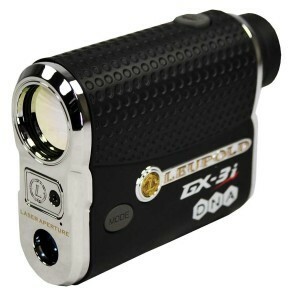 Appearance:The Leupold GX-3i boasts a sleek and appealing exterior. Size:The GX-3i measures 3.7 x 2.9 x 1.3 inches, making it small and compact enough for a comfortable fit. Speed: The GX-3i is quick in all modes. It powers on quickly and is also fast when calculating distances. Red OLED Display: The OLED display makes information more easily readable in different lighting situations and backgrounds. Accuracy: In addition to its speed the GX-3i is incredibly accurate when ranging targets. Shakiness: For the best chance of locking on the pin, the user must remain steady. Lithium Battery The unit uses a lithium battery that may run low sooner than others. Sensitivity: The GX-3i may be more sensitive when it comes to targeting trees or flagsticks. BlinkingData are shown as blinking readings that may prove to be a distraction to some users. The Leupold GX-3i fits average-sized hands perfectly with the distance reading button conveniently located on its top. There are two buttons in all, with the top button used for powering the unit on and rangefinding and the other used to change settings. The unit is vertically-oriented and easy to hold, featuring an aluminum exterior with rubber areas providing a solid grip. The model features a 6x magnification, which would be considered standard, as many others feature this or 1x lower/higher. The display is adjusted by twisting the eye piece, but it is not recommended to attempt one-hand operation while adjusting as it proves to be more difficult compared to other rangefinders. The GX-3i features a Scan mode that allows the user to read multiple targets in one swoop. The display is bright red and locks when capturing a target. Its PinHunter filters out readings from objects in the background, such as trees. 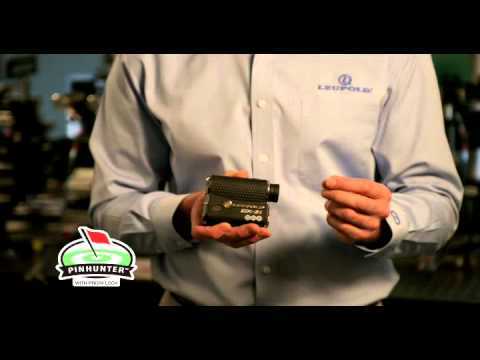 Prism Lock is enabled when scanning over 30 yards, and once the device identifies a flagstick with a prism it emits a beeping sounds, displays brackets and freezes the display at that distance. The manufacturer claims the GX-3i can provide distances to prime targets at up to 450/800 yards under the best conditions. Readings remain on the display for 8 seconds after the button is released. The laser can be continuously fired for over 2 minutes. The unit easily acquires flagsticks at up to 175 yards. Between 200 and 300 yards the Leupold GX-3i will still easily pick at targets against darker backgrounds. The Leupold GX-3i may be more expensive than other standard rangefinders, but it can be found for less than $400. It has a reasonable magnification and OLED display that justify its slightly higher price.